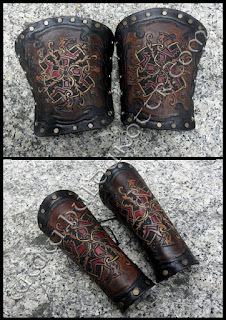 Wulfskara Bracers. Wulfskara means "Band of wolves" an elite warrior group from our upcoming novel "Hrops fram Halja" based on Therving tribes (Visigoths) on the 4th century CE. Keep tuned! Those bracers are for sale. Own design and free interpretation of the Fylfot (4 Fylfots in one), inspired by Migration period art.